I’m not real fond of sweet desserts but I am helpless, when it comes to Baklava. I simply cannot resist it. If I see it on the menu somewhere, I’ll order it, or torture myself with ” I shoulda/coulda had that” if I don’t get it. I love nuts, human and otherwise. And where I am going with this? Well, a few months back, when Debi Jordan was kind enough to come out and show us how to make Stuffed Grape Leaves, Robin also brought the makings for Baklava. 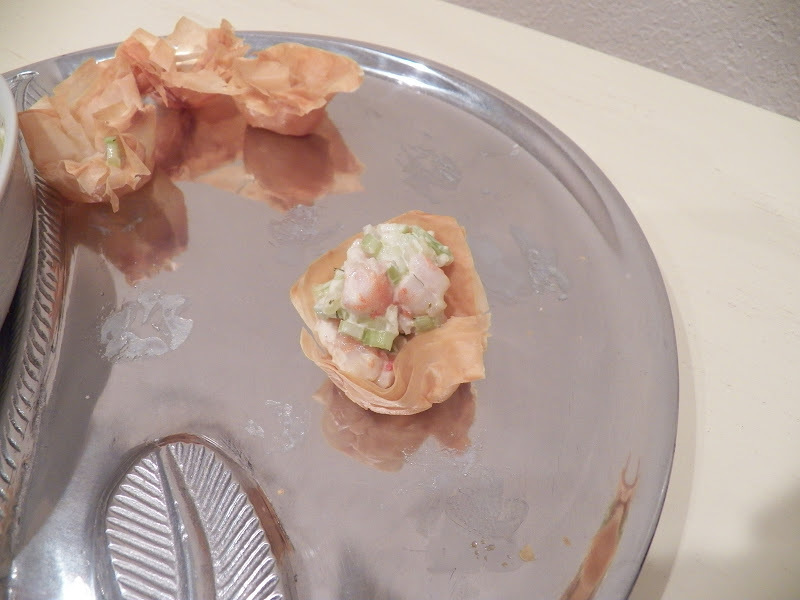 I’ve been really remiss in not posting about that, but I didn’t have a recipe, just lots of pictures of how to make it. And if I had realized just how easy it is to make Baklava, well, let me just say, I would have made it for years now. And eating it as well. Which may not be all that great cause I really have trouble not eating it when it is in the house. Fillo Dough, sugar, butter, walnuts, lemons, honey. Simple huh? You put all those things together and you get WOW. You actually start by melting some butter. Set that aside for a minute and get the fillo dough out. Unroll it, then, using a sharp knife cut it in half. We actually put it on a large baking sheet. Brush the bottom of the pan with some of the melted butter to start with. Also, it helps to cover the fillo dough with a damp towel once you’ve unrolled it. This stuff dries out and gets brittle fast. Take out a sheet of fillo dough, place it into the pan you’re using and brush it with some melted butter, repeat until you’ve built up a layer of 8 sheets. Once it’s melted, layer the fillo dough in an oven safe pan, and brush the layers with melted butter. Robin was working on three pans here. But she was up to it. She knew what she was doing. It was a regular assembly line. If you notice, the fillo dough extends up the sides of the pan, you need at least a 2 inch deep pan for this. Spread it out evenly, then continue with the next few sheets of fillo dough. you do want about 8 or so sheets of dough down. Then spread out some more walnuts, layer with more fillo sheets. 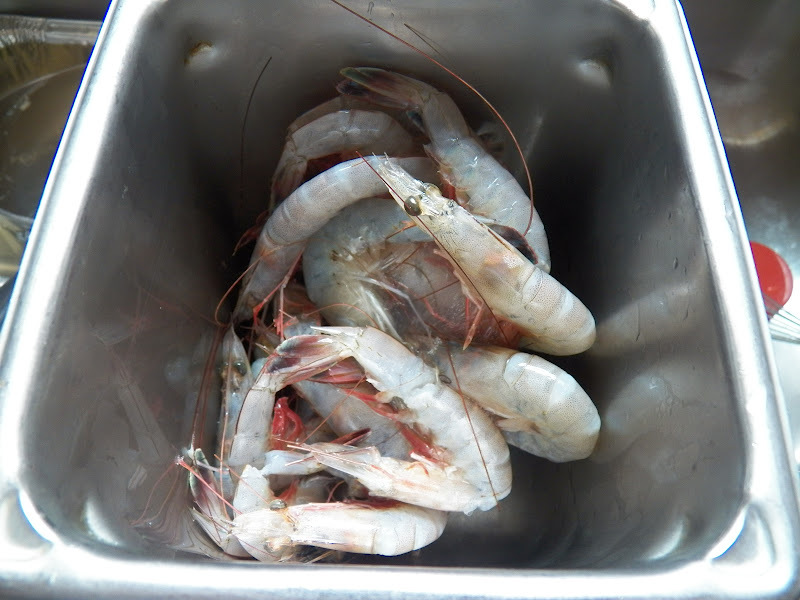 And of course each sheet gets brushed with some of that melted butter. And no, you can’t hear your arteries clogging up, you really don’t use as much butter as you think on the sheets of fillo. Continue on with the next layers of fillo dough, about another 8 or 9 sheets. You then cut it all the way through to the bottom, (trust me on this, you don’t cut it after you’ve baked it). If you happen to have a little butter left, just pour it on over the top. You want to make the honey/sugar syrup to pour over the top while this is baking. So go ahead and place the pan in a 325 degree oven for about 45 minutes or until the top is nice and brown. In a small pot place 1 cup of sugar, 1 cup of water, a cinnamon stick if you choose, and about 1 tablespoon of lemon juice together and bring to a boil. Let it cook down for about 10 minutes or so, until it is nice and syrupy. Add the honey and stir to combine. After you remove the Baklava from the oven, pour the honey/sugar syrup over the top, and let it rest. You really can’t eat this right away, it needs to sit and age for a couple of days – really it does. I know from experience. But after a few days, YUM is all I can say. I had to hide this from myself, and only allow a piece every few days. And I made that pan last, sigh. Sorry had to keep taking pictures, but doesn’t this look YUMMY? sigh, now I’m in the mood to make some more Baklava. Hey Robin, you wanna come over my house and bake again? Mix the walnuts, 1/2 cup sugar and cinnamon together, set aside. Melt the butter, and place in on a warming pan to keep liquid or use a small crock pot. Works, really. Take out the thawed phyllo dough (notice I’m using both spellings here, just saying) and place on a large cookie sheet, cover with a damp towel. Preheat the oven to about 325 degrees, or maybe just a tad cooler. Take out the pan size you’re going to be using. We used three pans here, but a nice big 9×13 pan would work. Brush the bottom of the pan with some of the melted butter, and then place one sheet of fillo dough inside, brush it with some of the melted butter, and continue with another sheet of fillo dough until you have 8 sheets layered. (Here is where you make a choice about how many layers you want. You can do up to four layers of nuts and dough. I’m going to give directions for three layers. ) Spread out 1/3 of the walnut mixture evenly over the pan. Spread another sheet of fillo dough over, brush with butter and repeat 7 more times. You can stagger the sheets of dough here so that they do cover the top evenly, and extend up the sides just a tad. That helps to keep the filling inside. Repeat with the last layer of walnuts and dough. Take a sharp knife and cut this into squares or diamonds at this point. Cut all the way to the bottom. You can’t cut it after it has baked, the phyllo dough shatters. And if you have any butter left, just go ahead and pour it over the top evenly. Place in the preheated oven for about 45 minutes to an hour and bake. While it is baking, make the sugar syrup. Place a cup of water, 1 cup of sugar and 1 tablespoon of lemon juice into a pan and bring to a boil, let it cook for about 10 minutes or so until syrupy. Then add the honey and vanilla and stir to combine. Pull the pan of baklava out of the oven and pour the sugar/honey syrup over. Set aside while it cools, then cover lightly and put in a safe place for at least 1 day if not 2 or 3 for it to set up before you eat it. If you can wait that long. I had fun playing around with some ideas for Tapa’s night this month, and I finally narrowed it down, and made a final decision, but it wasn’t easy. 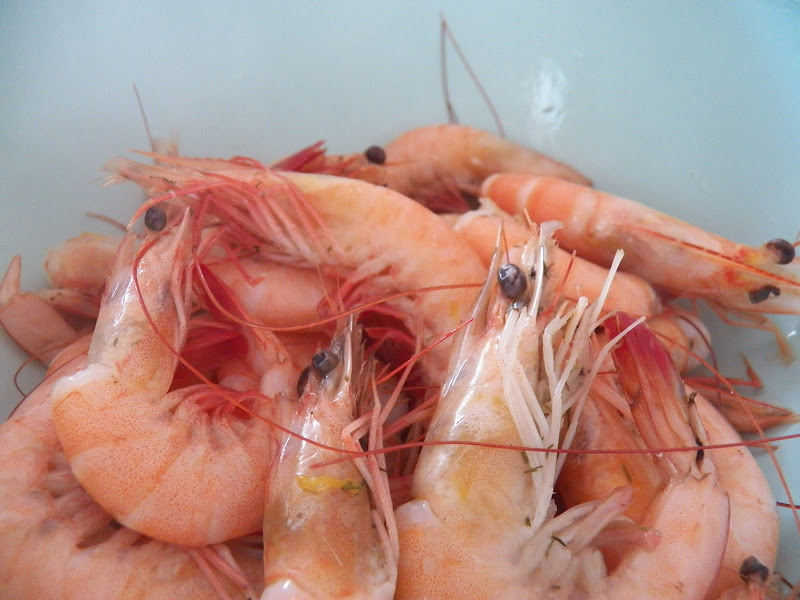 and make a Shrimp Salad. 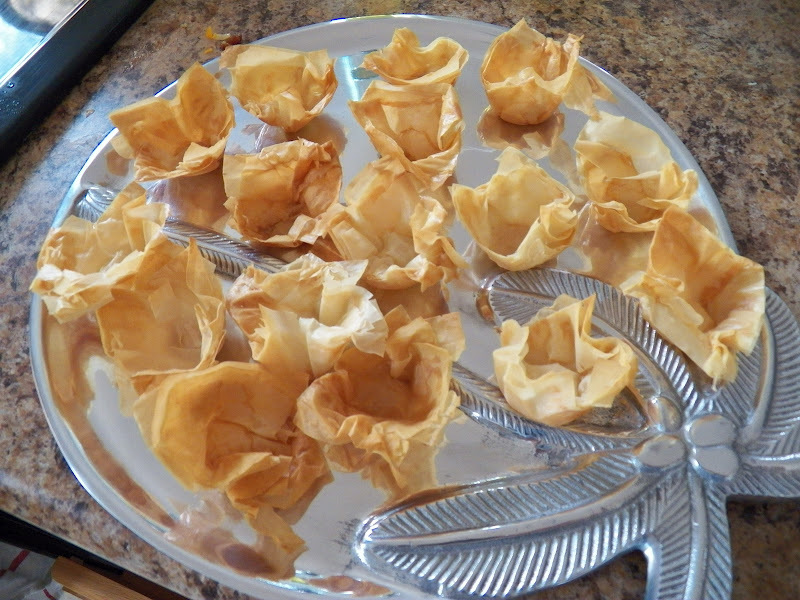 And while I didn’t have any crackers for the Shrimp Salad I did have some Fillo dough in the freezer so I made some Fillo cups. I found out Fillo dough is rather picky. It likes to be kept moist, dries out faster than I’ve ever seen anything dry out, but once you’ve got some butter brushed across it, it molds like a dream. Melt some butter, I think I used a quarter of a stick, just make sure you have a pastry brush handy. 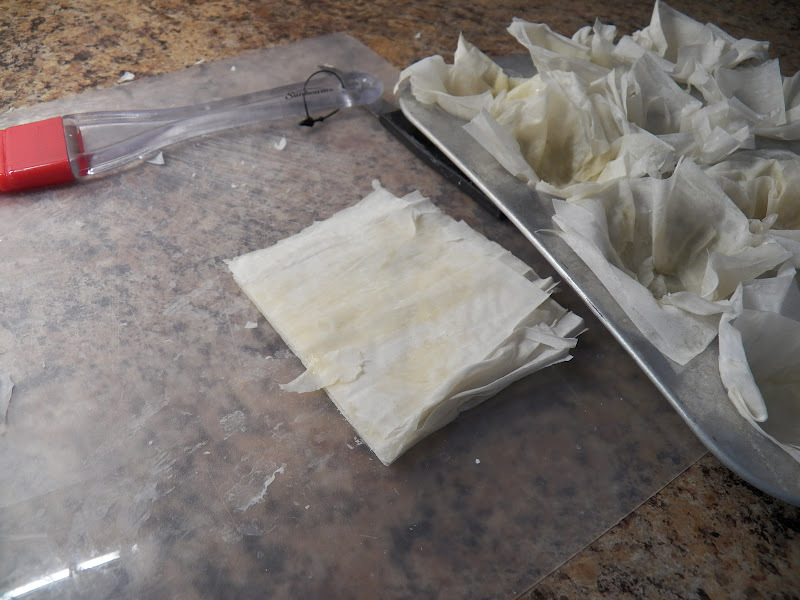 Unroll your sheet of Fillo dough, about three inches wide or so and cut into one long length. Keep the rest rolled up in the plastic wrapper, it does stay together better that way. (and make sure you take it out of the freezer about an hour before you want to use it. It does not unroll easily when frozen. Please learn from my mistakes.) Brush butter across one or two sheets of dough at a time, and stack to the side. I found it was easy to do that. Then take a sharp knife and cut that length into thirds. At this point pick up about 4 sheets or so of the dough and place into your mini muffin or tart pan. Pressing the dough down into the cup, repeat until all cups are done. Bake in a 350 deg. preheated oven for about 10 minutes or so until the cups are a lovely light brown. If you have more dough, cover with a damp towel to prevent the dough from drying out. I think you could also flavor the butter with some garlic or … just to add a little pizzaz. 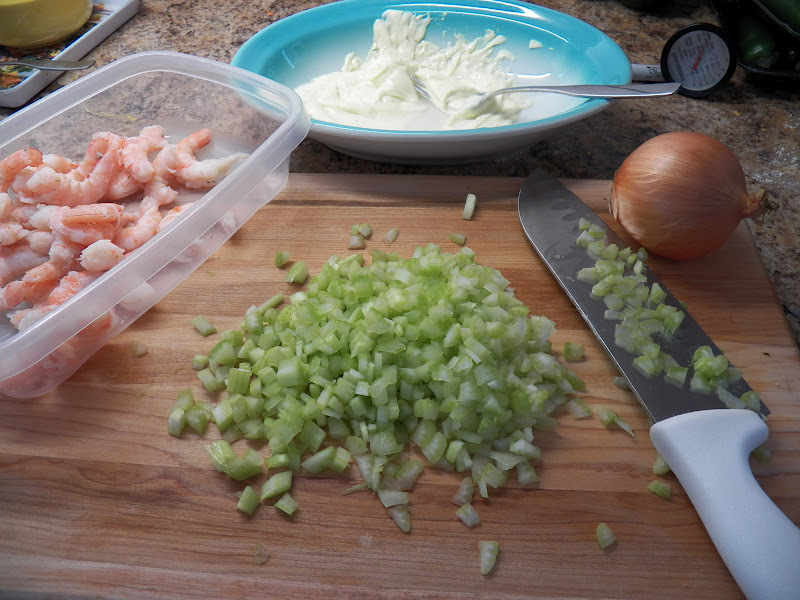 Set out with the Shrimp Salad and let your guests spoon the salad into the fillo cups. As you can see I got to the dish a little late in the day, and most of it was eaten already. Mix together and taste for seasoning, then refrigerate.